MACFE Doula services are provided for a fee of $650. Payment options are Paypal/Credit Card/e-Transfer or two cheques sent in at time of registration. (the links for payment are above or will pop up after registering) If you take a MACFE prenatal class you will receive 10% off the price of a Doula. All repeat clients will also receive that discount. * Families who meet low-income criteria are encouraged to contact MACFE for information regarding fee-assistance programs. * Other options such as payment plans can also be arranged. Please contact our Doula Coordinator to discuss this option. The word "doula" is derived from the Greek language and is an old custom revised. It is used to describe someone who provides support to a woman and her family during her childbearing year and who is trained in the process of labour and childbirth. MACFE Doulas draw on their knowledge and experience to provide physical comfort and emotional support. As well they help ensure that you have the information you need to make informed decisions as they arise in labour. They can provide reassurance, make suggestions for labour progress and help with relaxation, massage, positioning and other techniques for comfort. A Doula embodies women's wisdom. She is a compassionate woman that tunes in to the needs of the mother and mothers her. MACFE Doulas have experience and are recognized at all Winnipeg maternity hospitals as well as Selkirk and Steinbach. 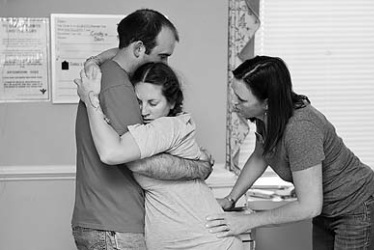 We also offer support at homebirths. Your Doula works for you, not your caregiver or hospital. perform clinical tasks, such as blood pressure, foetal heart checks, or vaginal exams. make decisions for you. A labour companion will help you get the information necessary to make an informed decision. reduce the length of labour by up to 25%. reduce the need for pain medication by up to 30%. reduce requests for epidurals by up to 60%. reduce the likelihood of a Cæsarean section by 50%. improve the relationship between mother and child. help the father participate with confidence. (Mothering the Mother/The Doula Book, Klaus, Kennell and Klaus). A Doula enters the space of a labouring woman and is highly responsive and aware of her needs, moods, changes, and unspoken feelings. She has no need to control or smother. Every pregnant woman should have the benefits of a Doula. This person does not detract from the role of the baby's father or co-parent, by the way. It enhances it and leaves him (or her) free to do the very important job of loving the mother (Christiane Northrup, M.D. Women's Bodies, Women's Wisdom). Click here to register for a doula.